This paper was made possible by the generous support of the American people through the United States Agency for International Development (USAID) Center for Resilience. The contents do not necessarily reflect the views of USAID or the United States Government. This systematic review investigates both the process of implementing mental health and psychosocial support programmes and their receipt by affected populations, as well as assessing their intended and unintended effects. How does the use of WASH interventions reduce disease outbreaks? This evidence synthesis identifies, synthesizes and evaluates the available evidence in order to find a response. 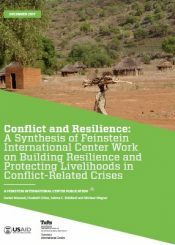 What effects do humanitarian interventions that support affected populations’ own shelter self-recovery processes have on household-level outcomes following a crisis? And what factors have helped or hindered the implementation of such interventions? This evidence synthesis represents the first ever attempt to systematically review the existing evidence for an answer. This protocol outlines plans for conducting an evidence synthesis on the impact of food aid on pastoralist livelihoods.